Your milking robots have been installed and startup week has arrived. Congratulations! Now the work can begin. The process will be happening 24 hours a day for the first few days so you will need extra people and some temporary gates. Your local Lely advisor will be available to help you make a proper plan. 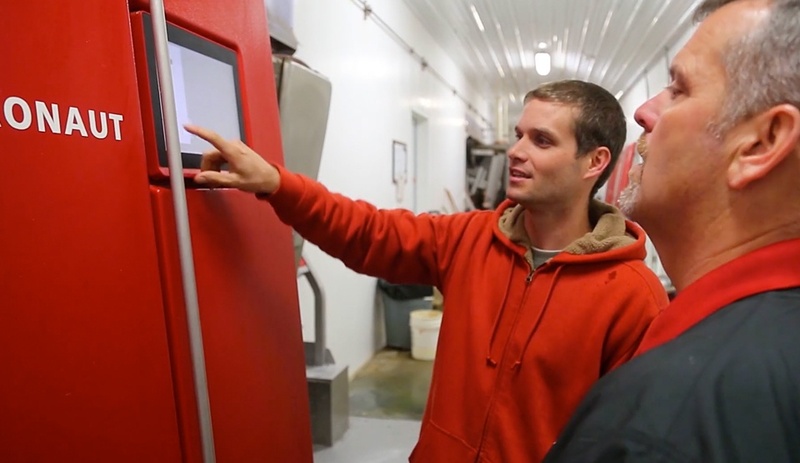 Our Farm Management Support (FMS) team has found that normally it takes one person in the robot room to manually wash and scan the cows for the first milking and one or two people in the barn to bring the cows to the robot. You should already have an idea in mind for which cows will serve as the startup cows. If possible, dry off cows that are late in lactation or producing less than 33 lbs of milk before startup. This will make the training period easier, since animals with a higher production have a higher energy demand, and will therefore be more easily drawn to the robots. If you have any cows that will not be staying in the herd, it is advised to cull them before startup so your time is spent familiarizing the rest of the herd with the robot with less competition. When you first start milking, you will have to tell the robot how much feed to give the cows. No production information will be present, so a general feed allowance is set that will match the needs of the majority of the cows. This is only a temporary setting; once production is stable you will switch cows to a custom feed table so feed allowance is specific to each individual cow. Make sure you keep an eye on production and visit behavior in order to see if cows are responding appropriately. Your T4C dashboard will make it easy to see how the herd is performing, for both the last 24 hours and the last seven days. The most important KPIs (key performance indicators) are milkings/cow/day (minimum of 2.6), refusals/cow/day (one on herd level) and failures (below five per day). Remember that there is a transition period for the cows, but normally by the end of the first month of milking, you should be getting numbers very similar or better than these. Through the startup process, you will need to check T4C consistently. The 10 reports below will need to be looked at twice a day. Your local Lely advisor will be available to support you throughout this period and even after.